Musicians came and went, but Ruthless Blues went on and on. Formed sometime in the late seventies, the nucleus of Ruthless Blues were John Knightsbridge and Paul McCallum who’d been in a band called Telemacque. Alongside them were Jim McCarty and Jeremy Trulove from Rennaissance, but the line-up has undergone many a change since them. Tony Fernandez replaced Jim McCarty, Roy Hill was lead singer for a very short time in 1980, so too was Johnny Mars for a while. Sometimes the band was a four piece, sometimes a five. Ever changing personnel aside, one thing was a constant – an electrifying stage show in pubs and clubs around London and the Home Counties. Eventually, their ‘sweaty sound’ was committed to vinyl , well tape actually – “Live At Angie’s” was recorded at Angie’s Club in Wokingham and released on cassette in 1985. 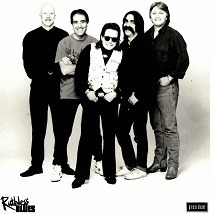 A second ‘live’ album/cassette, “Ruthless!” was recorded at Kingston Polytechnic in 1987 on which the brass section from Graham Parker’s Rumour expanded the sound. Word of Ruthless Blues reached President Records for whom two albums were recorded, “Ruthless Blues” in 1989 and “Sure Enough” in 1992. The band continued to gig right into the noughties and beyond. Who knows, another album might be forthcoming one day.